Lords Mobile Special Event: Birthday Treats For ALL! 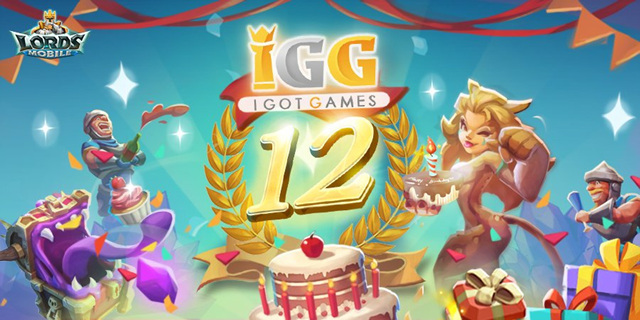 IGG was founded in 2006, and we are proud to have made many hit games in these 12 years! We want to continue to bring the best games to YOU, all our wonderful player. Thank you for supporting us, and please enjoy our birthday festivities. We're celebrating this incredible milestone with the following events! During the event, Guild Leaders can send all guildmates one [IGG Birthday Box] per day! This special box features a randomize assortment of 12 prizes, including the grand prize of 120K Gems! The greedy [Hoarder] is hungry for shinies! Complete Guild Bash quests and reclaim the treasures within the [Hoarder], and you could get 100,000 Gems or 100,000 Holy Stars! It's raining Gems! Gem Lodes will be appearing on the Kingdom Map from 6/6 13:00 ~ 6/7 12:59! Ready your gathering troops and be the first to grab those Gems! Follow Lords Mobile Facebook page and share IGG 12th Anniversary Video to win Gems, Energy, and Speed Ups! Previous Previous post: Lords Mobile – How to Shelter Troops ? Next Next post: Lords Mobile: The Way to Get the IGG Birthday Box!